We have extended our range of real ales to 4, and will try to have 2 regular beers on offer, Hancocks HB 3.6% and 3 guests, (1 local and 1 national brand). In this way we can offer our customers a great range of traditional ales to suit all palates. 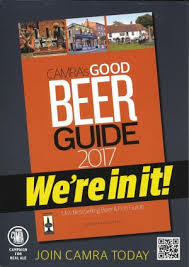 We are delighted to be recognised by CAMRA, we would like to thank all the breweries that have supplied us with excellent beer and thanks to the CAMRA members who included us.